Roisel Communal Cemetery Extension, Roisel, Somme, France. Patrick Kennedy, was born Patrick Boyle likely in Glen, although Mohill is noted in some surviving documentation - however this may be an error. While the CWGC entry gives his age as 40 at the time of his death, he was actually born in late 1885 and was baptised in the parish of Ardagh on the 25 December 1885. Patrick grew up in Glen, Edgeworthstown where his father was a school teacher, and later attended St. Mel's College in Longford town. It appears that he later became a national school teacher and by 1911 was teaching in Co. Carlow. 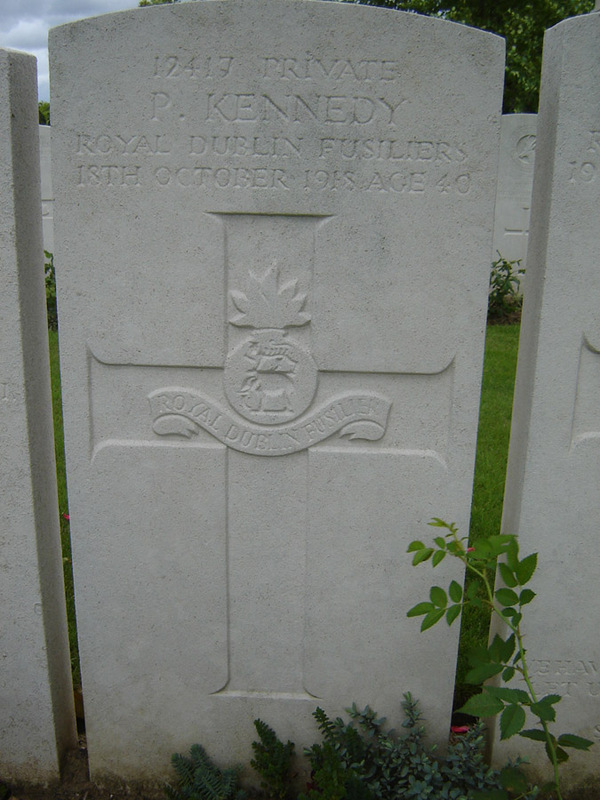 Patrick enlisted in Naas, Co. Kildare, but served under his mother's maiden name of Kennedy. He was killed in action during a joint assault with the Wiltshire Regiment, Kings Royal Rifles and the US Expeditionary Force, near the village of Honnechy, south-east of Cambrai during the Meuse-Argonne Offensive. Son of Patrick Boyle and Elizabeth (née Kennedy) of Glen, Edgeworthstown. It is difficult to ascertain due to the uncertainty about his name and age, but it is likely that Patrick was himself a national school teacher, and taught in Co. Carlow prior to the war.